The Duke of York’s Theatre was opened 10th September 1892, it’s a beautiful, if small and cozy looking theatre. For this production the space was made even more intimate by the removal of 12 rows of seating from the stalls to install the Lear Lounge at the rear where people could enjoy a drink or two. 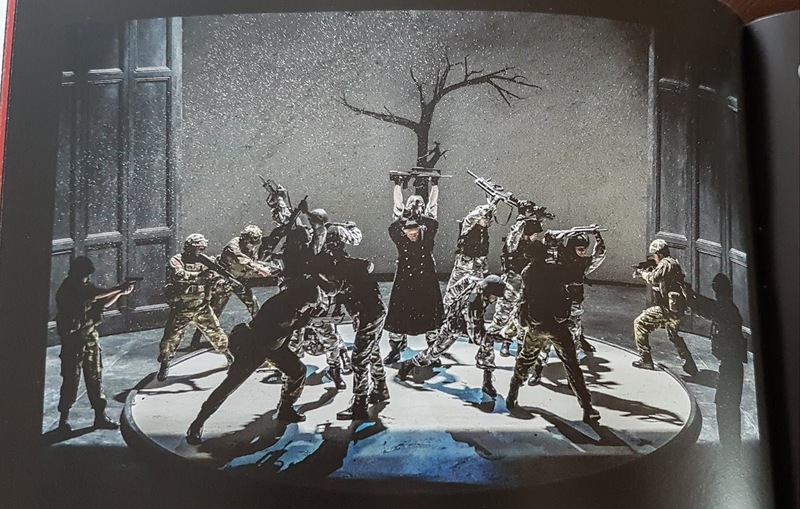 A central runway was also incorporated between the back of the theatre and the stage, allowing the actors to bring the action even closer to the audience. The play commenced with a beautiful aria sung by the cast, it sounded like something you would hear in high church, however, as the production continued we moved between the paganism of the Celtic King, to modernistic office scenes; soldiers wearing army desert camouflage uniforms carrying rifles, to a scene of armed combat with daggers. Oak paneled rooms gave way to a stark clinical torture room or the bare wasteland of Dover. 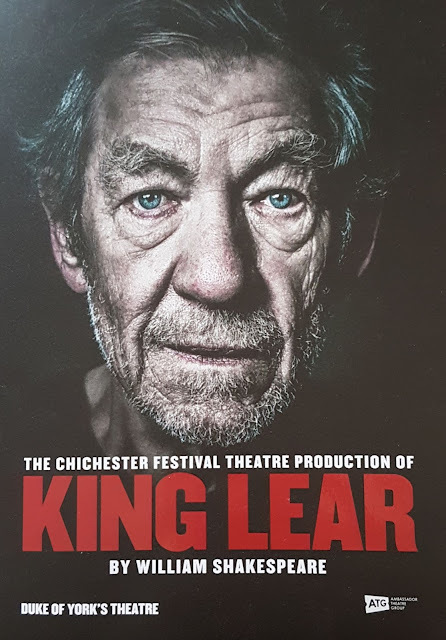 It all seemed a bit contradictory and confused, although despite these inconsistencies, I found the evening highly entertaining and I relished the opportunity to see Sir Ian shine as the tormented king battling dementia. Lear is an aging king who has decided to step down from his throne. His kingdom is to be divided equally between his three daughters, however, they must first express their love and devotion to him. Whilst Goneril and Regan are happy to testify, Cordelia, Lear’s youngest daughter refuses and she is banished from the kingdom. 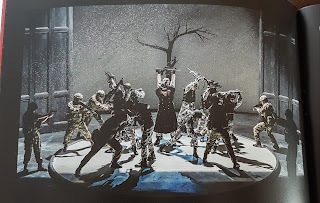 Lear begins to question whether he has made the right decision, beginning to realise that Goneril and Regan are betraying him and undermining what little authority he has left, and slowly his sanity wanes. 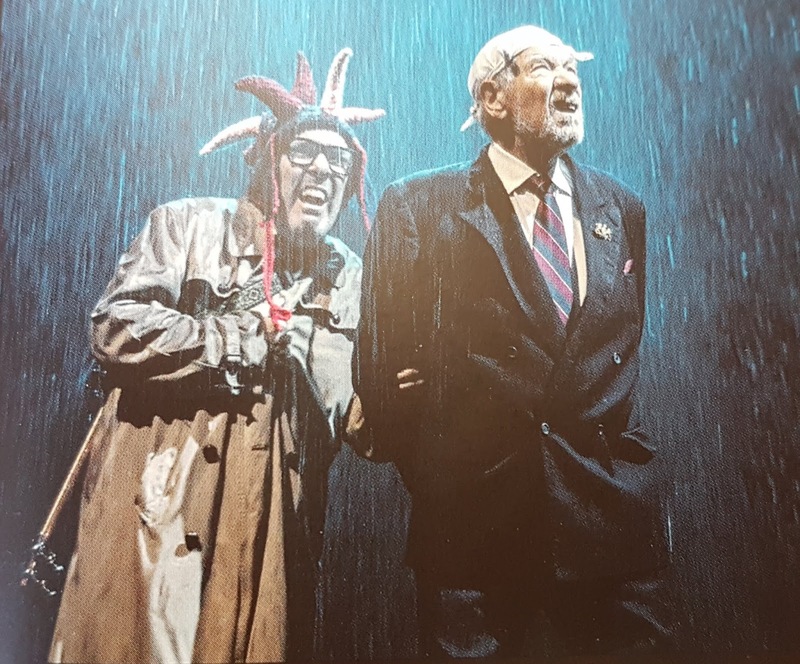 McKellen is spellbinding as he takes a journey through the frailty of old age – from a strong, vicious and cruel leader, to a weary, forgetful man suddenly aware of his own mortality. McKellen’s poignant portrayal of this beleaguered king is in stark contrast to that of his somewhat disturbed daughter Regan. 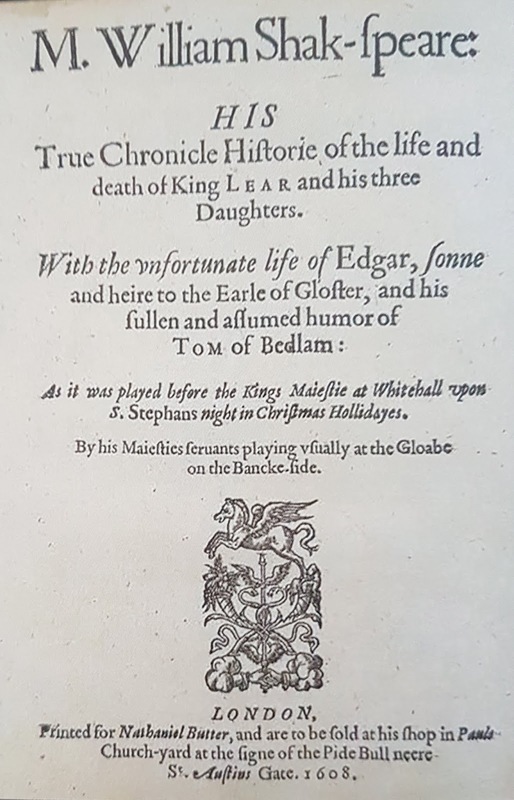 A nobleman, Gloucester, realises that Lear’s daughters have turned against him and therefore he tries to help Lear despite the dangerous repercussions of such an act. Regan finds out and accuses Gloucester of Treason and has his eyes gouged out. It’s a distressing and stomach churning scene, however this Regan appears sexually aroused by this malicious act and screeches around the stage like a demented harpy. Another character prone to exaggeration is the Fool, but this George Formby, ukulele playing comedian was too gimmicky and overbearing for me and served more as a distraction than as the character who used his position to give Lear advice as he embarked on his adventure into the wilderness. Whilst this play had the opportunity to highlight political authority descending into chaos, and how unstable a governing body can be when external influences thwart it, this production seemed to concentrate more on the personal journey of a man and his family and the consequences of how cruel people can be to those they love. Is there any justice in the world? It’s a hard question to answer. The wicked get their comeuppance and die, but those that have done no wrong also die. So, probably the answer is no, there is no real justice in the world. 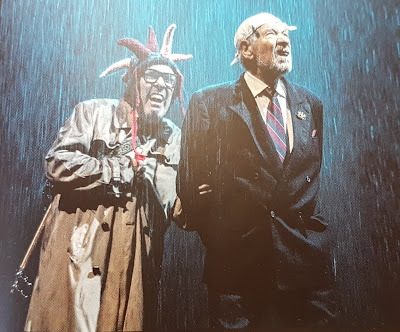 But whatever niggles the production had, McKellen’s performance was a shining beacon in this dark Shakespearean tragedy and I'm thrilled I had the opportunity to witness it first hand. King Lear runs until Saturday 3rd November at The Duke of Yourk's Theatre, London. If you can't buy tickets, NT Live is streaming the production to theatres on 27th September 2018 - see link for details.